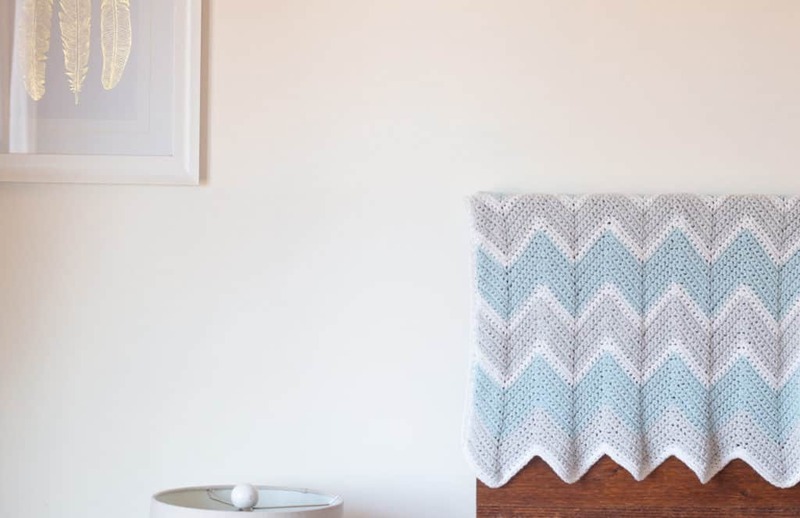 Make this simple crochet chevron baby blanket today with the FREE crochet pattern below! 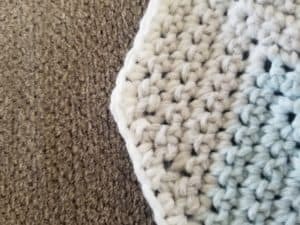 I tend to use single crochets a lot in my patterns like these easy crochet baby blanket patterns. 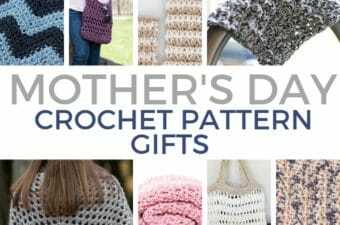 Believe me, if you can do a single crochet, then you are good to go for this project! In my opinion the newest yarn from Lion Brand, Feels like Butta is the ideal yarn for a baby crochet blanket! It is amazingly soft and is machine washable / dryable which is a must have for a blanket that will be used constantly. It is a 100% polyester yarn and comes in over 30 different colors so that you’ll always be able to find the perfect color. Use 3 colors or only 1 for this chevon blanket! I know I used 3 colors for my blanket but if you prefer you can use only 1 color of Feels Like Butta and have way less ends to weave in. Lion Brand also sells bonus bundles of this yarn so you can get even bigger skeins to use. The regular skeins are 100 grams vs the bonus bundles that have 275 grams. This whole blanket only takes 269 grams so you could actually get way with using one bonus bundle of this yarn as long as gauge is followed correctly! Take a look at the yarn colors I picked! If you’d like to take a look at the yarn colors I used I linked the yarn up below (affiliate links). Go ahead and check out each one to find the color that’s just for you. I’ll explain a bit more about them a little further down but I couldn’t wait to show you the actual colors! 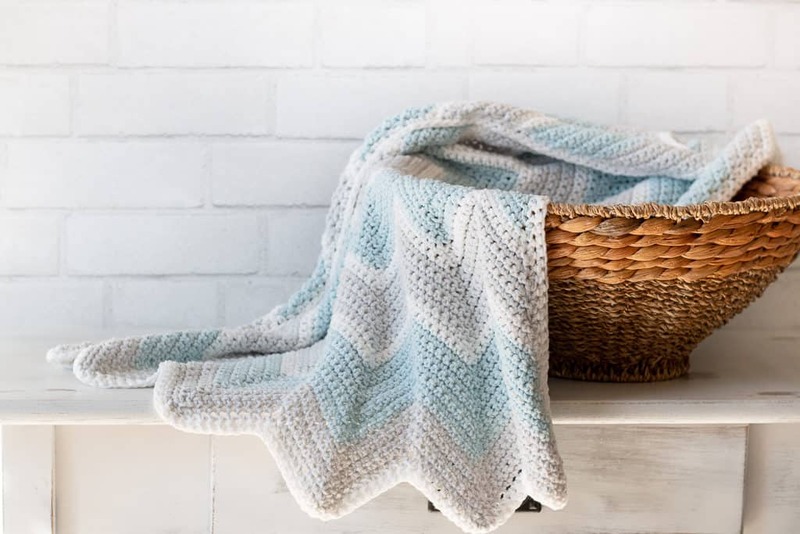 Neutral colors are perfect for this crochet blanket! For this blanket I decided to go with soft neutral colors. I opted for Ice Blue, Pale Grey & White because I loved how muted they were! Feel free to pick any colors because I am pretty positive any color from this line would look AMAZING! 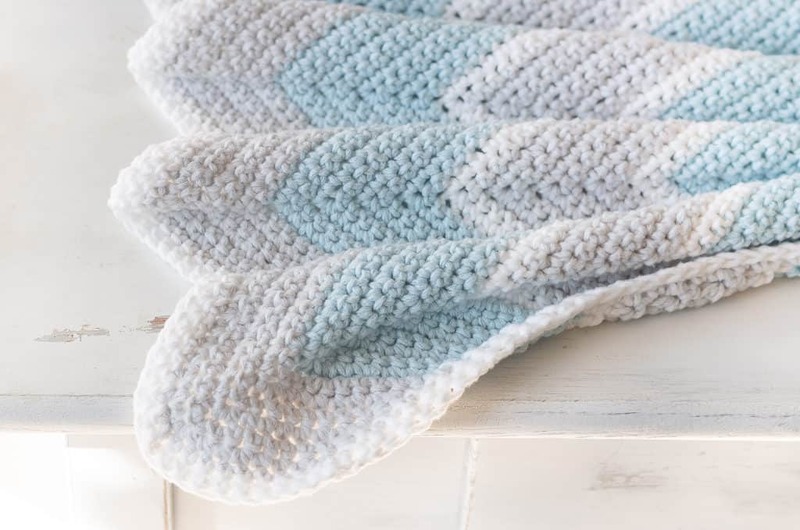 Are you ready to get started on your new favorite baby blanket pattern? I can’t promise that this chevron pattern will be your new favorite but I am hoping that it does. 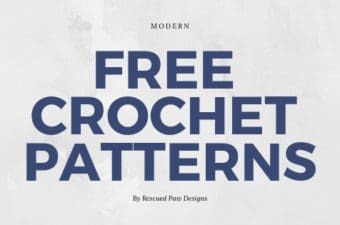 Read on down for the full, free pattern and be sure to tag me on Instagram or share in the RPD Facebook Group if you do make it! Make a tension sample in a 5″ x 5″ swatch using a starting chain of 41 x 10 rows using the pattern below. If your sample is bigger try to crochet more tightly. Change sizes by using a multiple of 21 + 20. So that means that you will need to use a starting chain in a multiple of 21. For example… 21,42,63,84,105,126,147,168,189,210,231,252,273 etc. then add 20 chains to that total. 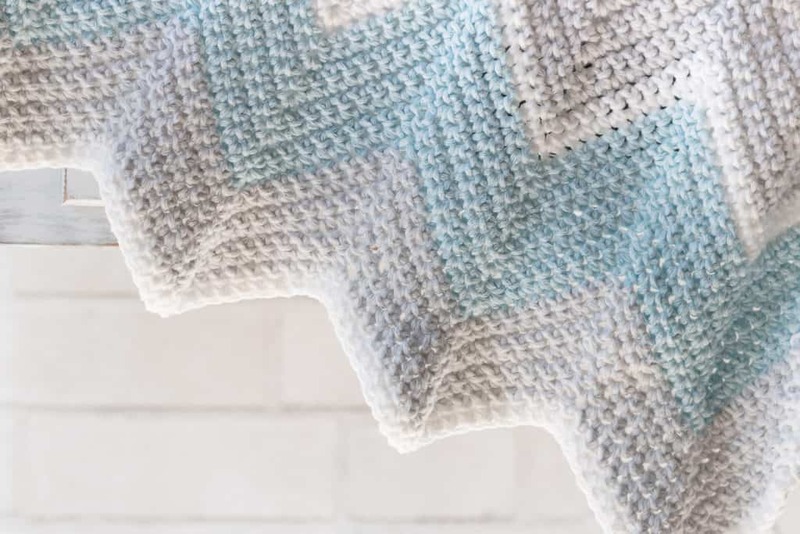 You will need to be familiar with how to change colors in crochet with this blanket. Row 1: sk the first ch, sc 2 tog, sc once in each of the next 7 ch’s, sc 3 x in the next ch, *sc once in each of the next 9 ch’s, sk 2 ch’s, sc once in each of the next 9 ch’s sc 3x in the next ch, repeat from * across until you are left with 9 st’s, finish by sc once in each of the next 7 ch’s, sc 2 tog, turn. Row 2: Ch 1, sc 2 tog, sc once in each of the next 7 st’s, sc 3 x into the next st, *sc once in each of the next 9 st’s, sk 2 st’s, sc once in each of the next 9 st’s sc 3x in the next st, repeat from * until you are left with 9 st’s, sc once in each of the next 7 st’s, sc 2 tog, turn. 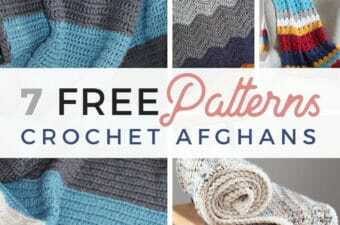 Row 3: – repeat row 3 for the remainder of the pattern switching colors as indicated below. Do not fasten off yarn at the end of your project. Join in the white yarn, turn your work and crochet sc’s evenly across the entire last row. At the end of the row work 3 sc’s into the last st to make a corner, continue sc down the entire side of the blanket evenly into the side of each row. At every corner do 3 sc’s and continue this pattern along the entire outside of the blanket. 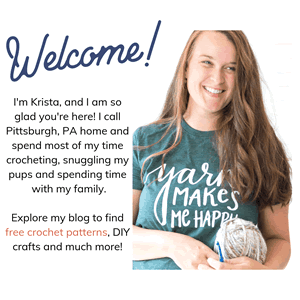 You can do 2 rounds of a single crochet border or just one. Either way would look nice! After you are done with the border use a yarn needle to weave in all the ends of the blanket. The chevron stitch does tend to take on a wave like appearance so I’d recommend blocking your finished blanket. 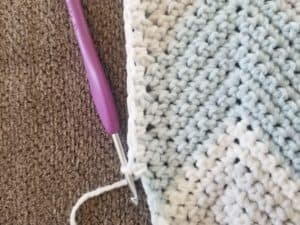 You can use the blocking techniques I talked about in my post “how to block crochet” to help you with this part. 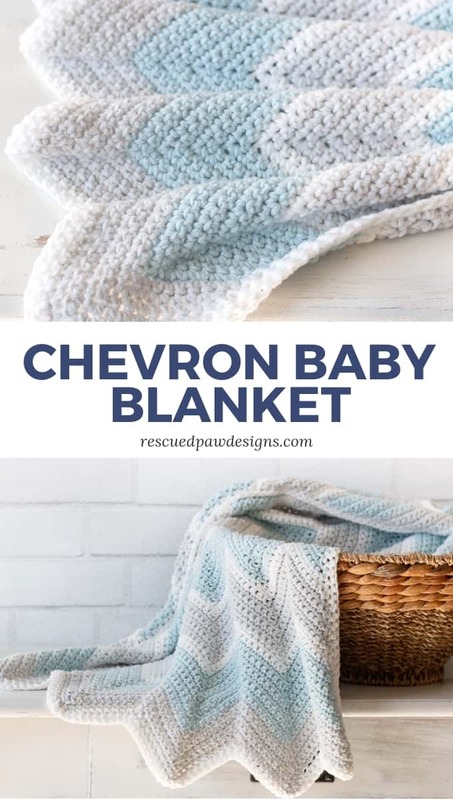 You are done with your chevron blanket for Baby! See how easy it was? I really love how this chevron stitch worked up with the higher peaks which is exactly what I was hoping for. 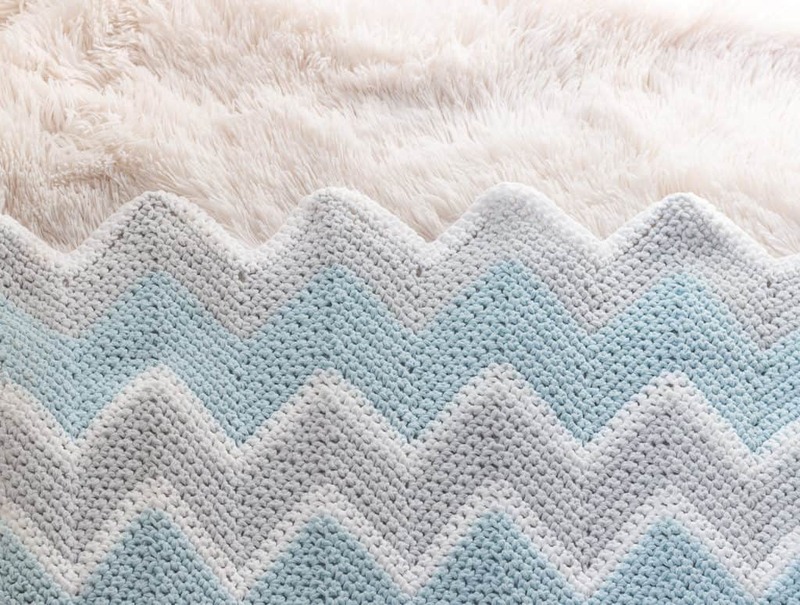 I designed something similar with my “Neutral Chevron Blanket” which is also a chevron but with smaller peaks! If you love chevron patterns I’d suggest definitely checking that blanket out too. 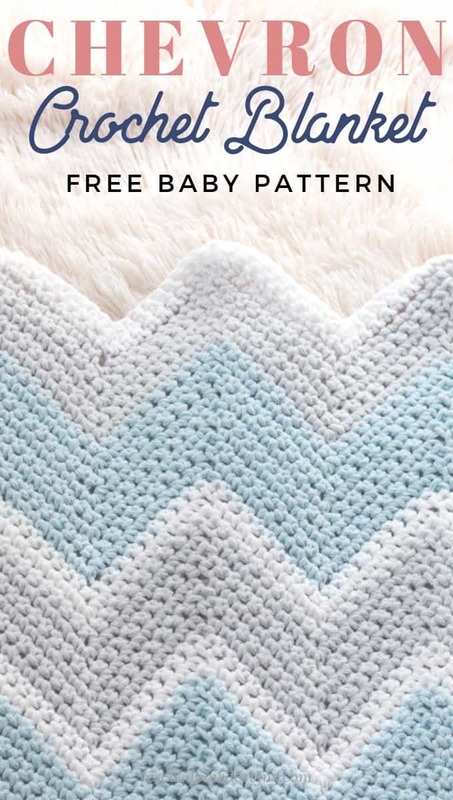 I am interested in making the baby chevron blanket, but I’m not seeing what size crochet hook to use? Opps. I forgot that part! I used a 3.75 mm. I updated the pattern too. I have started this chevron baby blanket three times. I am not getting a V pattern. You said you updated the pattern. Was there an error and where is the update? 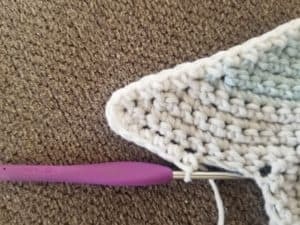 The V pattern is created by single crocheting three stitches in one stitch (top of the zig zag) and skipping two stitches at the bottom. I updated the pattern with the correct hook size (if you are referring to the comment section) It was left out by accident when it was originally published.